BATH, Maine — Bath Iron Works will reach a major milestone in the process of building a next-generation warship Thursday when it celebrates the keel-laying for the first Zumwalt-class destroyer. The first Zumwalt ship, known during construction as DDG 1000, has been under construction at BIW for more than two years. The Zumwalt class, which incorporates several new technologies from weapons systems to propulsion to stealth capabilities, originally was planned by the Pentagon to replace the Arleigh Burke-class destroyers that have been under construction at Bath Iron Works since the late 1990s. Earlier this year, the Pentagon scuttled that plan because of concerns about the cost, but proceeded with the construction of three Zumwalts, all of which are being built in Bath. DDG 1000 is named after Adm. Elmo Russell Zumwalt, a Navy legend whose career culminated in the early 1970s as chief of Naval Operations, according to information from BIW. 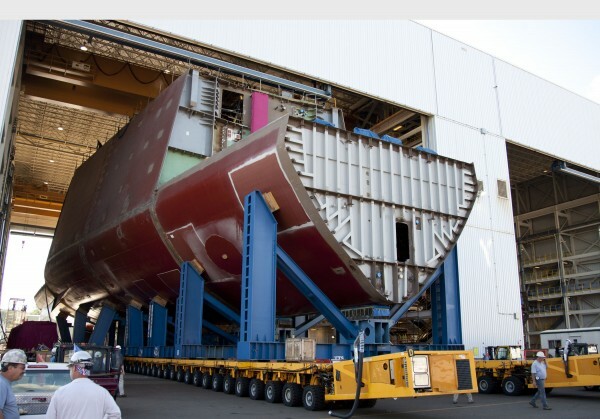 Because Thursday is a normal work day for BIW, the keel-laying ceremony is not open to the public. Zumwalt attended the U.S. Naval Academy and was commissioned as an ensign in 1942. He served on destroyers during World War II and earned a Bronze Star for Valor at the Battle of Leyte Gulf. After the war, Zumwalt rose quickly to prominence in the Navy, including becoming the youngest-ever chief of Naval Operations. He was famous for his “Z-grams,” directives he distributed with the strict expectation for prompt action. Among his major initiatives was the advent of the Oliver Hazard Perry class of frigates. Zumwalt is perhaps best known for radical changes he led in the areas of racism and sexism throughout the Navy fleet. All four of Zumwalt’s children — Ann Zumwalt, Mouzetta Zumwalt-Weathers, retired Marine Corps Lt. Col. James G. Zumwalt and the late Elmo R. Zumwalt III — will have their initials inscribed on a steel plate that will be welded into the ship at a later stage of construction. On Thursday, welding arcs will be struck on the steel plate as a ceremonial authentication of the DDG 1000 keel unit. According to BIW spokesman James DeMartini, construction on the Zumwalt began in February 2009 with a completion date of sometime in 2014. Construction also has begun on DDG 1001, the future USS Michael Mansoor, which has a delivery date of December 2014, and materials are already in the pipeline for DDG 1002, which has not yet been named. That final Zumwalt-class ship is scheduled to be delivered in February 2018.